We all need a good-tasting vegetable appetizer that won’t ruin the appetite for the rest of the meal. Whether you serve a vegetable dish for game day or holiday, these dishes will be well received. Saute garlic in olive oil for about 1 minute – do not burn. Add the spinach leaves and saute until spinach is wilted. Remove from pan, drain excess liquid and set aside. In bowl, mix other ingredients together; add chopped spinach and mix. 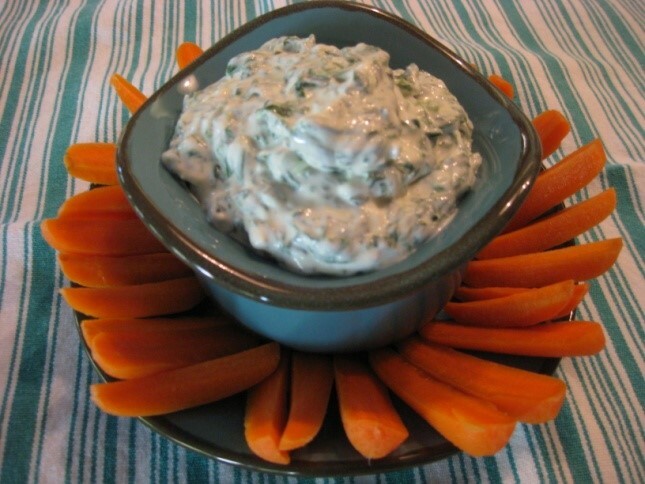 Serve in a bowl with mixed vegetables to dip: carrots, cucumber slices, jicama strips, broccoli florets, etc. Endive leaves, about 6 heads, ends cut off and large enough leaves to fill with chopped lettuce. Save smaller inside section for adding to the lettuce mix. Lettuce mix: chopped endive, radicchio, and arugula, about 4 cups total. Add finely chopped Romaine lettuce if you like. Shredded high-grade parmesan cheese, about 1/2 cup. Lemon Caesar dressing: 2 T. Mayonnaise, 2 T. plain Greek yogurt, 1/4 cup olive oil, and juice of one lemon. Add 1-2 tsp. country Dijon mustard, dash of Worcestershire, 1 minced garlic clove, and salt and pepper to taste. If dressing is too thick, add a little more olive oil. Wash each endive leaf, lay on paper towels to dry. Wash other lettuce; chop finely and put in a bowl. Make the dressing. 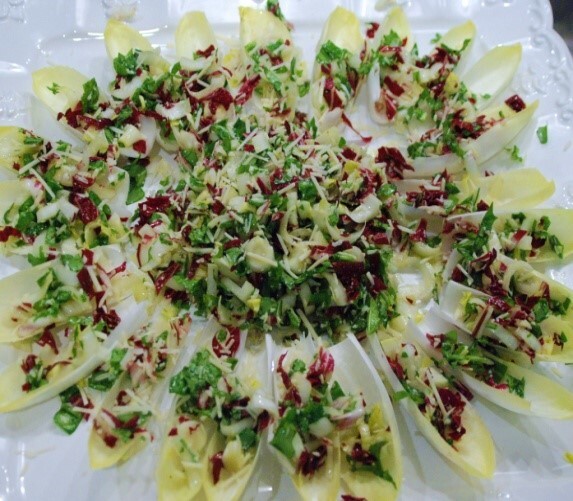 Lay the large endive leaves on the outer edges of a tray, leaving the center open. Toss the chopped lettuce with the dressing and half the Parmesan cheese. Sprinkle the lettuce mix into each endive leaf and put the remainder in the center of the plate in a mound. Sprinkle the remainder of the Parmesan cheese on the entire dish and crack a little pepper over the top. Serve immediately. You can also arrange smaller trays for more intimate dining. Nutritional Analyses: Not done on these appetizer dishes. They are all low-carb, fat content is moderate, and should be accompanied with a protein dish for a nutritionally balanced meal. Always eat in moderation.